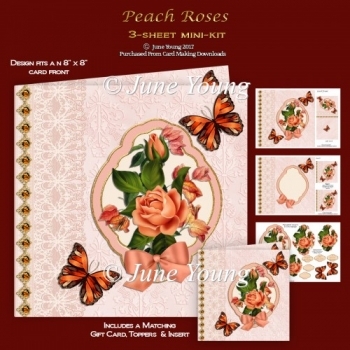 A three-sheet mini-kit which fits an 8 x 8 card front, featuring: a spray of Peach Roses, set in a shaped panel against a damask and lace background, and embellished with a large Silk Bow and toning butterflies. The first sheet has the card front and matching gift card, sheet two has lots of decoupage and the five greetings panels, two are blank for your own words. Sheet three has a matching insert with two small toppers which can be used inside the front of your card or to make a smaller card with, These designs can be used for many different occasions and are ideal to keep as 'stock items' if you sell at craft fairs etc.